A confession: I’m a huge lover of soft, almost gooey cookies; for example, I love biting into a soft, super chocolatey, chocolate chip cookie, and letting the aromas and flavours of good quality chocolate and vanilla roll around on my tongue. 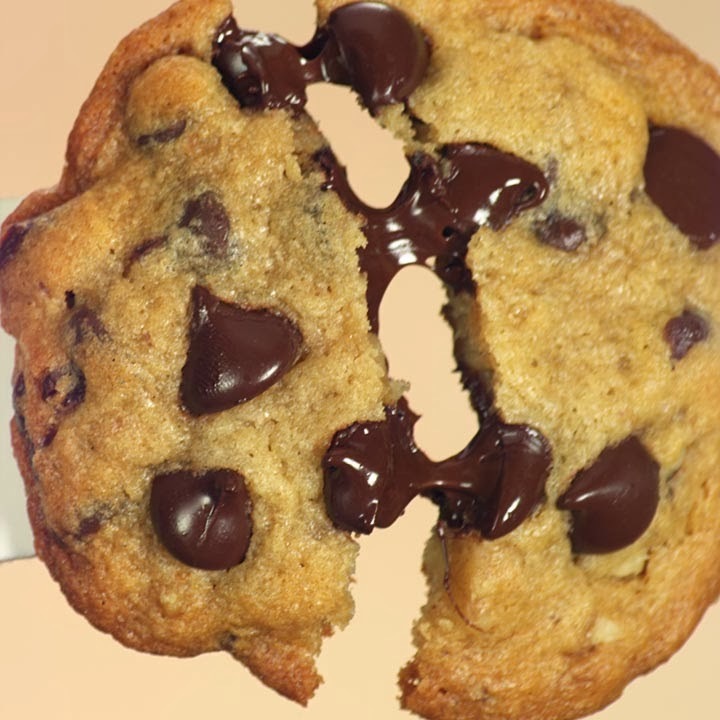 How could people not love the intense flavour melding with a gooey cookie? In other words, I am not so much of a fan of the crunchy cookies. I always manage to drop bits of them on me, and I’m always worried that I look like Cookie Monster when I eat them. There is simply no way to look dainty eating a cookie that crumbles away in your hand as you try to consume it. Having said that, I firmly believe in “different strokes for different folks”, and my lesser-enjoyed cookie may well be another’s favourite ever-EVAR. So is the case for biscotti. 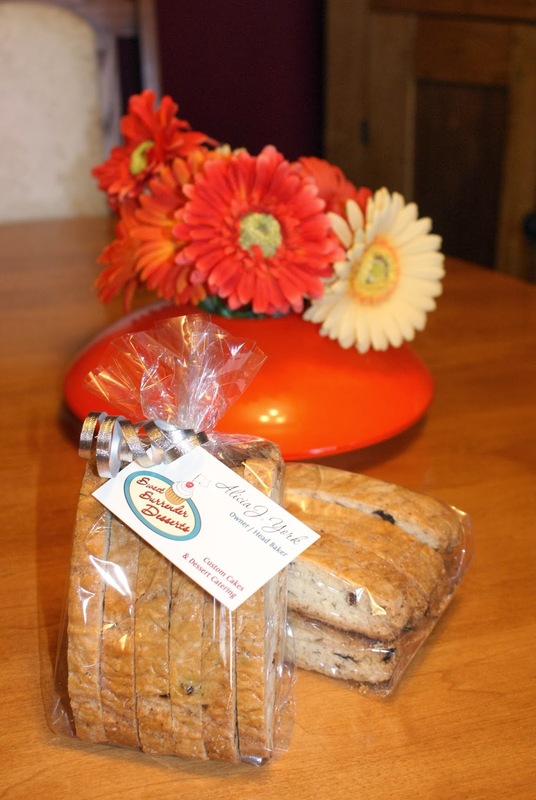 I cannot envision a time where I would make biscotti for myself as a treat (though I discount nothing), but some of my clients are positively gaga for them, and will order those over virtually anything else I could offer them. The recipe below is one I developed recently for a specific client, to have a bit of a “change up” from the same two biscotti recipes he orders from me every few weeks. In fact, I made some for him just a few days ago, and he was such a huge fan, he opened a package right then and there and started offering them out to his clients on the spot. There’s no better advertising than a huge, goofy grin and “yum” face as someone eats something you baked for them! Give them a try, if you like a crispy, crunchy cookie that is strong enough for you to dip in your latte or espresso; keep in mind, however, that as light in colour as they look, they are actually *very* intense and on the bitter-chocolate side in flavour. Preheat oven to 350 degrees F (175 degrees C). Line a heavy duty cookie sheet with parchment paper. Cream together butter and sugar in a bowl until light and fluffy. Beat in eggs and vanilla. Sift together the dry ingredients in a separate bowl. Mix dry ingredients into the egg mixture. Stir in the chocolate chips and almonds. Shape dough into one large, flat log approximately 18 inches long by 8 inches diameter. 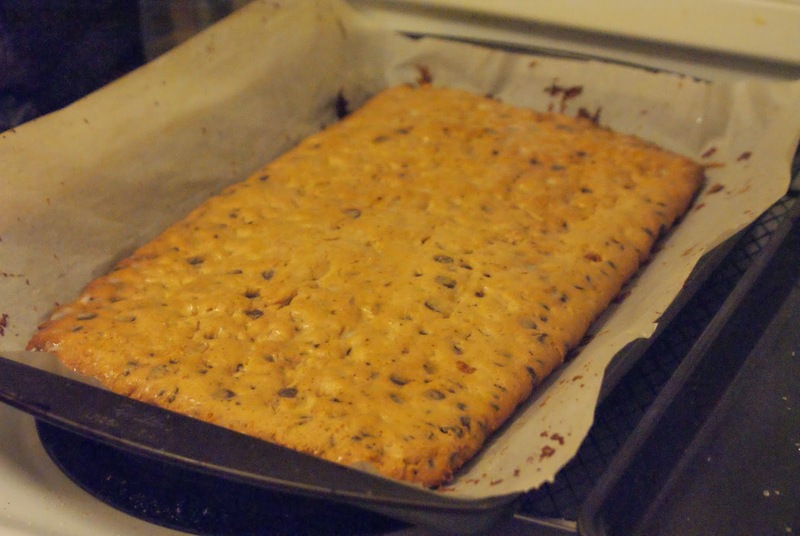 Place log on baking sheet, and flatten out to about 3/4″ thickness. Brush with the beaten egg white. Bake in the preheated oven until edges are golden and the center is firm, about 35 to 40 minutes, rotating the pan once during baking. Remove from oven to cool on the pans for about 15 minutes. Reduce oven temperature to 325 degrees F (165 degrees C) for second baking. When loaf is cool enough to handle, use a serrated knife to slice into 1/2″ thick slices. Return the slices to the baking sheet, spread apart from one another by 1/4″. Bake in reduced heat oven about 15-20 minutes, or until they start to turn light brown on the edges. Cool completely, and store in an airtight container at room temperature. Previous Post The 2013 Great Food Blogger Cookie Swap! !